A War of words / word play/ we need investigative journalism. In this post I am going to use the Bill Clinton statements about the word "is" to show that we really are in a war of words. It is extremely important not to accuse officials of miss conduct when what is really going on is a miss comprehension. Many are not criminals and should not be treated as such. My dad who was a deputy sheriff before I was born taught us about the proper use of words. He did so specifically so that we could talk properly with other law enforcement officials. They all know what many call legal speak, but is really grammar and definitions of the terms you use. When you don't speak properly it makes the Official go on guard, because he must pay more attention to what you say for the purpose of gleaning intent. It also makes the Official aware that they can use word play to glean guilt or innocence. 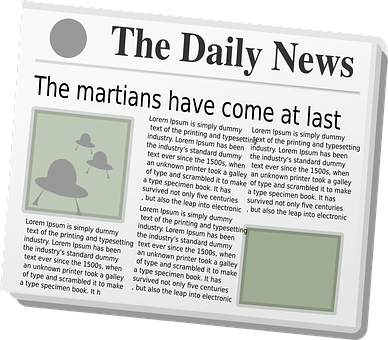 The purpose of this post, is to make #familyprotection and #informationwar content writer's aware of the word play being used to cover up criminal activity's. Along the way I will try to show how to ask questions that can obligate the Official. At the end I will leave reminder tips that we all should remember. My Dad said often that "There are just as many criminals in law enforcement as there are in any group of people" and he would also say. "Costumes and badges don't mean a honest john". So it is important that we at all times remember we are dealing with people. As my reader's know, I like to look in Law Dictionary's and discover exactly what they are claiming . This allows me to use logic and reason about the claims and the situation. It also allows me to spend my time asking question and not answering them. One should always have some way of gathering the evidence. Photo's and recorders on cell phones are great, but you should also invest in ways to gather evidence that are not easily identified as cameras or recorders. One should also make sure you have more than just a few copies of everything. So lets see what Bill Clinton's Meaning of is, is all about from CHATTERBOX. Bill Clinton and the Meaning of "Is"
The distinction between "is" and "was" was seized on by the commentariat when Clinton told Jim Lehrer of PBS right after the Lewinsky story broke, "There is no improper relationship." Chatterbox confesses that at the time he thought all these beltway domes were hyperanalyzing, and in need of a little fresh air. But it turns out they were right: Bill Clinton really is a guy who's willing to think carefully about "what the meaning of the word 'is' is." This is way beyond slick. Perhaps we should start calling him, "Existential Willie." 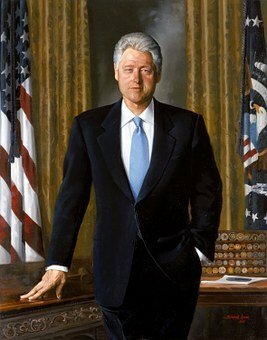 Source CHATTERBOX : Bill Clinton and the Meaning of "Is"
The question we all need to be asking about this definition of "is" : is Clinton right? Not in the sense of morals, but in the factual sense. Is the word is, a word that denotes present tense? It does and really the fact that many people do not use the word in a grammatically correct format does not in fact change the tense function of the word. Had Chatterbox used "was" or asked the question "Was there at anytime improper relations with Ms. Lewinsky" Clinton would most likely have faced consequences as President of the UNITED STATES INC. Thus we see that familyprotection and informationwar writer's can be alerted in the application of tenses. We should become sensitive to past, present and future phrasing as we begin questioning any agent. Would = future and means have not. Could = does not mean you will. It is extremely important not to accuse officials of miss conduct when what is really going on is a miss comprehension. If you ask a official open ended question they can give open ended answers. Living being asking. : Could you write in the report that I didn't do this? Official answer: Yes I could. This doesn't create any obligation to make the official actually write anything in the report. Could never means will nor does it mean someone did do a thing. It is like asking if you could make dinner. Answering yes doesn't obligate you to make dinner. Properly asking a question, can if answered yes, obligate the official. Living being asking : Will you write in the report that I didn't do this? Now according to the dictates of grammar and the definitions of terms used the Official is obligated to write exactly that you didn't do it. We have not had real investigative journalist in a very long time. I like to use old law dictionary, because one can easily see the intent as well as the definition. Also many publisher's who are doing new publications are also changing the definitions. Law is not supposed to change by any other artifice other than ratification by we the people. We are not going to go over the entire definitions, but will pick those that are Germain to the subject. I will also show you a screen shot from the actual PDF so that you can verify and confirm for yourself what it says. 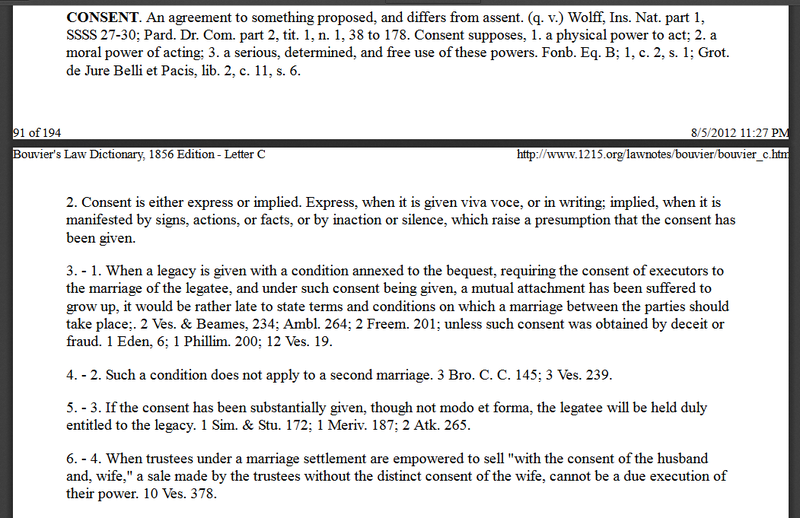 Now let us look at what consent is in Boviers Law 1856 dictionary. 2. Consent is either express or implied. Express, when it is given viva voce, or in writing; implied, when it is manifested by signs, actions, or facts, or by inaction or silence, which raise a presumption that the consent has been given. You see that consent is either implied or Express. It is also implied by inaction or silence, which raise a presumption that the consent has been given. 3. Consent is never given so as to bind the parties, when it is obtained by fraud. As informationwar and familyprotections content writers begin expanding there content to include investigative journalism we must all be extremely careful in how we ask questions of these official's. We as living beings are not bound by any code or restrictions. However Agent's of these Agencies are. They are claiming De jure status which means they must respond to questions. Not doing so creates consent if you ask the question properly. Thus we must all use reference material like Law dictionary's to educate ourselves so that we know the difference between lawful, legal acts and words. So I am pretty sure that a living person knows when they have given consent. I am also pretty sure that a living person knows when they are under a contract. I am also sure that it is not possible for you to have given your consent if you didn't even know you were in a contract. Which to me is why number 3 is so important. One if they cannot prove that you knew your rights at the time and that you knew through full disclosure what your obligations in the contract was (which you couldn't know without knowing you are in a contract in the first place) than it is clearly fraud. Spend your time asking question and not answering them. Always have some way of gathering the evidence. Invest in ways to gather evidence that are not easily identified as cameras or recorders. Make multiple copies of everything. Learn the basics here>committee's of safety! All photos are from Pixabay.com. Screen shots are mine. I am not responsible for if you think, how you think, what you think or do. You Are!. If you like my content consider a up vote and follow! Peace! A way to make free BTC and 4.08% interest in a BTC savings account. Interested in joining or supporting the Information War? Use tag #informationwar to post your own stories about the lies and propaganda being pushed on the public. @informationwar will up vote posts worthy of the cause. Join the discord: https://discord.gg/JsXbzFM chat with like minded individuals like myself and share your articles to receive additional support. Delegating Steem Power: Another way you can support the cause is to delegate SP to @informationwar. Delegate 100 SP Note: remember to keep around 50SP in your account so you don't run into any bandwidth problems. Find out more about the Information War. Click Banner!